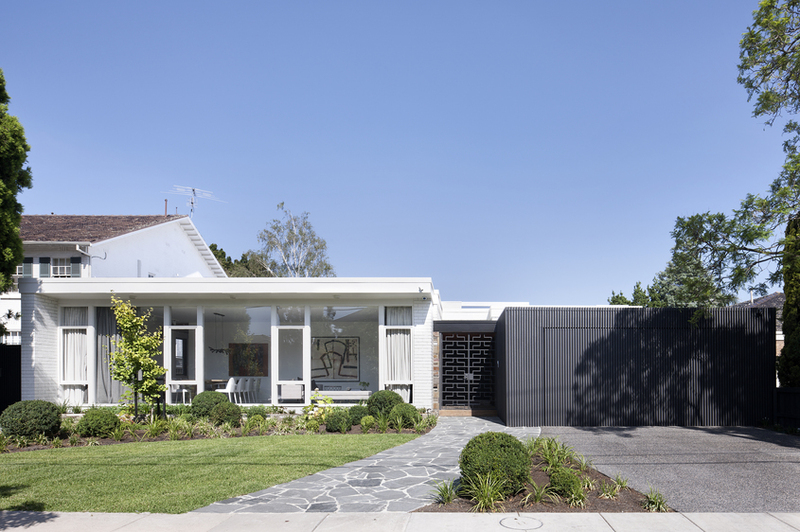 Bower Architecture designed this bold extension to a 1960s house located in Caulfield, Melbourne. The project brief was for a sustainable and private house containing a variety of living spaces with connections to the outdoors. The new dwelling, referred to as Stepping House, consists of two new rear wings and a courtyard pool added to an original orange brick house. 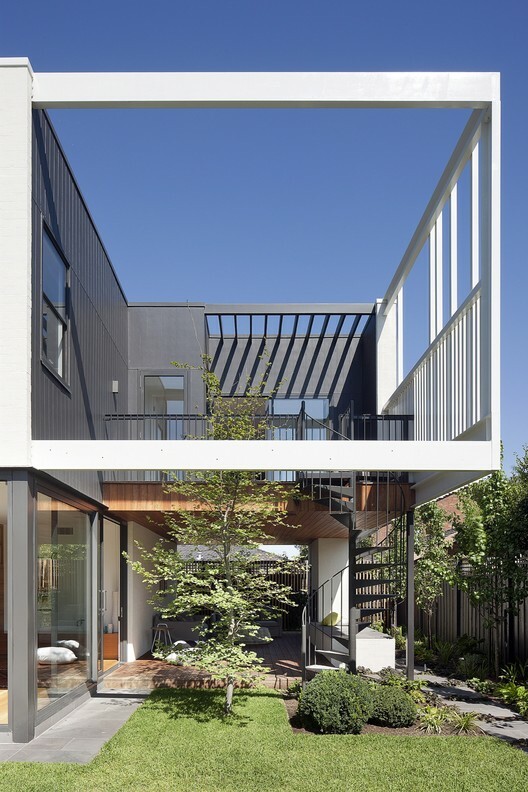 Bower Architect’s design concept divides the old and the new into three parts (the steps), of increasing size in a U arrangement around a central outdoor space. The house integrates well with the landscape and flows beautifully as its transitions in both volume and scale from the street. The absence of a front fence allows the house to engage with the street and the low entry tunnel and dark entry foyer dramatically frames the view towards the landscape and pool beyond. Jade Vidal of Bower Architecture talks of the importance of concealing the new areas in an attempt to retain the modest 60s frontage. The additions are not intrusive with the introduction of only a new front door and dark vertical timber cladding to the old carport. “You only get a glimpse of what is beyond that elegant, simple, single-storey frontage. Yet, when you walk in, you find a 500-square-metre house that is full of surprise”. The architect has also explained that “we wanted to show that in making big spaces, it was really important to have gestures that broke up those spaces.” They have used pergolas and louvred frames to great effect. Various connections are made from the living areas to the external spaces throughout. The central living area connects to the northern and southern outdoor areas, creating natural cross ventilation. Fragmentation of the rear two storey bedroom block is accomplished with cantilevered forms and a floating steel frame. They have also chosen to experiment with textures, an example of this is where they have played with whites across various textured surfaces including abundant bagged brickwork. 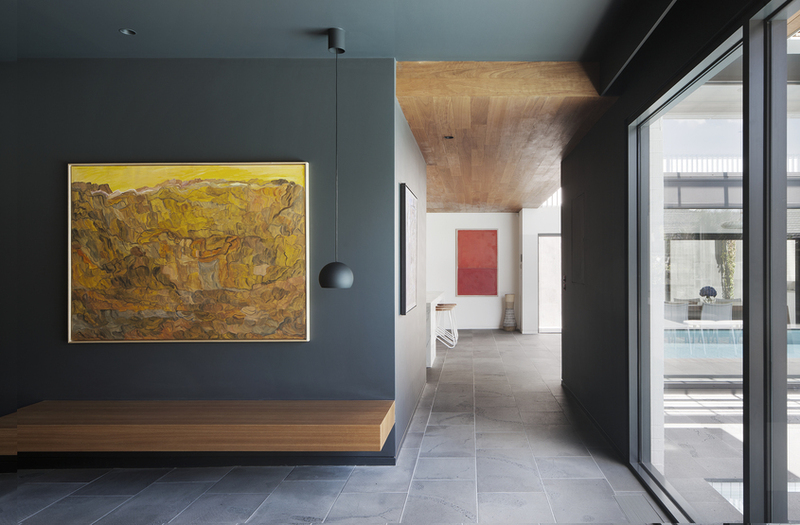 The language of framing, screening and textured surfaces is continued through the joinery and interiors where richer materials are placed alongside a restrained palette, re-interpreting the 1960’s language of the original house. Australian bluestone and blackbutt timber surfaces add warmth to the powder room and kitchen. Cost reducing passive sustainability systems were integral to the design and were facilitated by the U shaped plan with a northerly living aspect and sun shading along its entire length. A strong horizontality in the new single-level and a multi-spatial living wing that adjoins the new double level rear wing with the four bedrooms, hints at Modernism. However the designers are quick to point out that it “doesn’t replicate it. We hope the house is of its time”. By the way, don’t be concerned if you are overwhelmed by a positive nostalgic feeling when you drive past these orange brick sixties houses. Quietly we are starting to love them. Sources: Bower Architecture's website, 'Amazing Designs: Stepping House', Domain, Sydney Morning Herald, 24/10/2015.